Nothing worse than boring, and one of the best remedies for boring is variety. We had a day filled with variety. We peddled 87 miles today and we are staying on the shore of Somerville Lake which is just South of College Station and NW of Houston a couple hundred miles. We started out and went through a Park for 17 miles. It was very pretty but I was about done for when we finished because there was hill after hill that was super steep, 8 to 10 % grade on some I am sure. It was so humid that we were soaking wet with sweat all day long and I couldn’t wear my glasses because they would fog up so bad I couldn’t see anything. Then we went through an area that was having the 28th annual “Antique Show”. There were literally hundreds of big tents, houses, businesses that were part of this event. The traffic was crazy, it was bumper to bumper for miles. We were riding through this and there was zero shoulder. People were yelling at us and being very impatient and rude. Then it started raining to boot. We eventually made it through that and the weather even improved. I bought some very nice bicycling rain gear before we left on this trip and put it on this morning when we left camp but because of the humity and heat I was soaking wet with sweat in a very short time so I took it off and tied it on the back of the bicycle and when it started to rain I left it off because the rain felt so good. Yesterday we went through some road construction. One of my major frustrations with road construction is usually they haven’t thought out what they are going to do with bicycles. The flagger person has everyone stopped waiting for the pilot car and when we ask if we can go ahead and go, the response is we have to wait for the pilot car, but then when he comes they leave us behind and usually make 2 or 3 trips back and forth while we ride through going around trucks and graders and construction crews as best we can. When my brother Cliff and I rode our bikes to Fairbanks, Alaska they would put our bikes in the pickup that was the pilot and let us ride up front with the driver. Tomorrow we are going to ride 88 miles and I am hoping for boring. This entry was posted in Uncategorized on March 31, 2016 by deefduke. This entry was posted in Uncategorized on March 30, 2016 by deefduke. 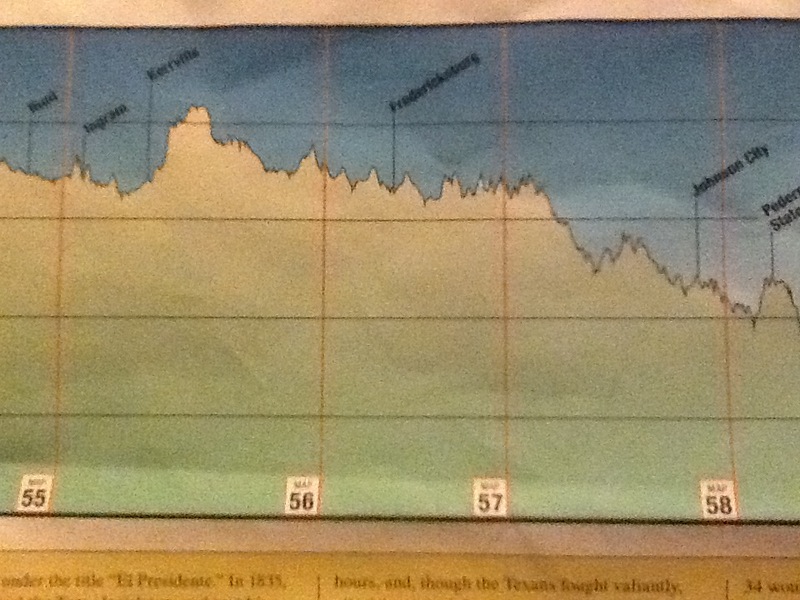 This is an “Elevation Profile” of the section of roads that we bicycled today. It is probably hard to see but each of the little bumps is a hill or what we call a roller. Some are very steep and others a little less so. On an average they are 2 or 3 hundred yards from the lowest point, the gully as it were, to the top or crest. I think today was my favorite day of the trip. It wasn’t particularly easy, 76 miles of rollers. We ride up for several hundred yards and then down. 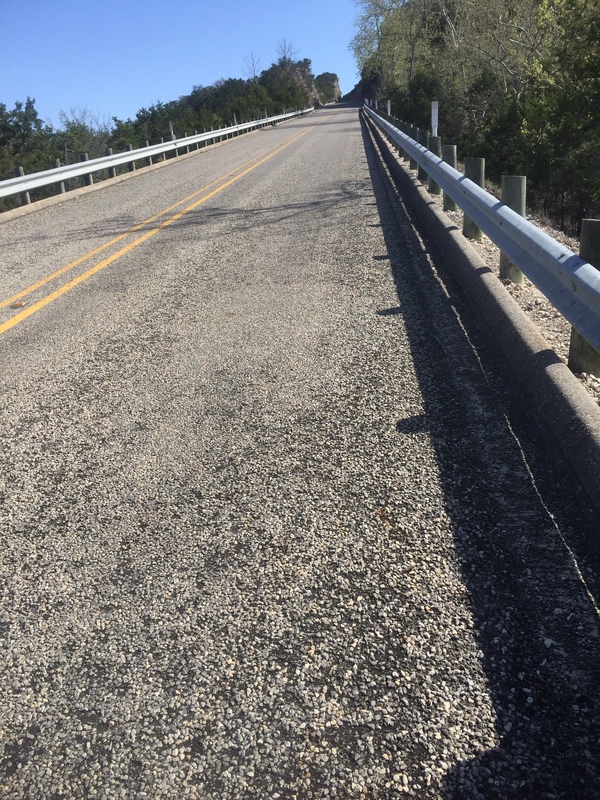 When we are going down we are shifting fast and peddling hard to get our speed up to about 25 mph, depending on the length of the descent, then we hit bottom and start up peddling hard and shifting back down keeping our speed up as long as we can. By the time we reach the top we are usually in 1/1, that is the smallest of the three sprockets in the front and the biggest of the 9 sprockets in the back, the lowest gear on the bike, then we start down again and shift fast through the gears and are quickly in 3/9, the biggest sprocket in the front and the smallest in the back, the highest gear on the bike. Over and over we did this like a big long roller coaster. By John’s count we had 82 rollers today. There was a lot of flat riding as well and the scenery was super. It was sunny but not to hot. The roads we traveled were back roads with very little traffic. With all that hard, fast peddling up and down hills my legs feel like rubber tonight. The “Route Elevation Profile” looks pretty much the same for tomorrow so I am hoping a good nights sleep will get me ready for another fun day on the roller coaster ride. This entry was posted in Uncategorized on March 29, 2016 by deefduke. We took Saturday and Sunday off from riding as rest days at an RV park in Ingram, Texas by the Guadalupe River. 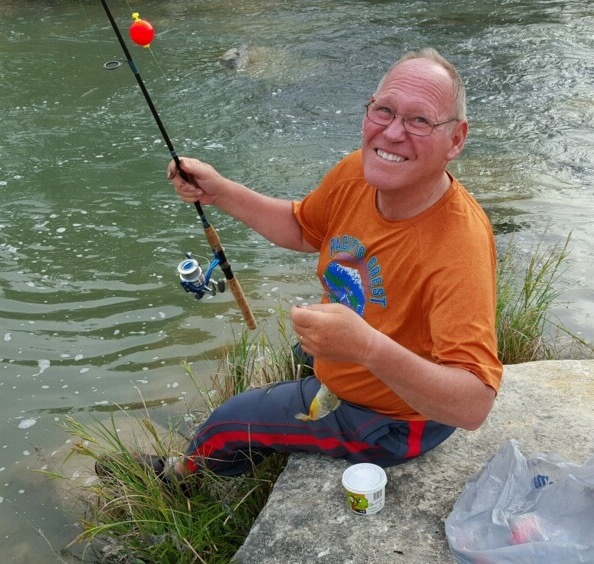 The lady in the office said I could borrow her fishing rod and the ladies bought me some hooks, split shot, bobber, leader, and worms at WalMart and I relaxed away quite a few hours sitting on this rock catching blue gills, all of which I released. I didn’t bother with sun screen because I thought I would only be an hour and I forgot my hat so I sun burned the top of my head pretty good. I keep forgetting how little hair I have up there.😀 We walked to a church this morning that was just 4 years old that had bought a beer warehouse and remodeled it for a worship center. It was a great service. It was great to see a new church as healthy as it appeared. I had a hard time because I can’t hardly figure out what people are saying with that thick Texas drawl. I smile and nod my head during most of the conversations hoping that it is appropriate to what the other person is saying. We are back on the road in the morning planning on about 85 miles. We will be just north of San Antonio headed for Austin. The terrain is becoming much greener and less arid than it has been since the start of the trip. We are seeing less and less cactus. We have had only a little rain in the middle of the night on a couple of occasions, but the chance of rain is increasing as we head East. If we get some heavy thunderstorms we will take an unscheduled rest day and wait it out. Hopefully that won’t happen. We are over half done with the trip and I still have not had a flat. Some have suggested that it is because I am drafting behind John and he has had 9 flats and he is picking up the wire before I hit it, but I never ride directly behind him because I like to see what is up ahead so I ride 6 to 12 inches to one side of him. We will see how long the streak lasts. This entry was posted in Uncategorized on March 28, 2016 by deefduke. I was rereading the story in the Bible about Caleb where he says when he is 85 years old, “I am as strong now as I was when I was 40, give me this mountain to conquer”. I wonder how strong I will be at 85 years of age. I wonder how many years I can Pastor and preach effectively. I wonder how many more years I can bicycle. I can hope, and I can pray, and I can set goals, but only God knows what His plans are for my life. I am working hard at doing my part to exercise to keep my body strong and memorizing to keep my mind sharp, but God must bless. At this point I am planning on continuing on in ministry until I am 80. I have a goal of doing a 7,000 mile bicycle trip where I would hit every one of the lower 48 states in 4 months in about 5 years from now. It might happen, I don’t know, but I am going to plan it anyway. I feel pretty good right now in my tent at 11 pm writing this blog, but when I wake up in the morning I could feel aweful. I love the Lord with all my heart and I want to serve Him as long as I can, but He is in charge and I trust Him with my life with no hesitation or regrets. So anybody want to go with me on a 7,000 mile bicycle trip? This entry was posted in Uncategorized on March 27, 2016 by deefduke. I don’t know if the steepness of this road shows up in this picture to you. It was mostly 7% grade and went for several miles and there were 3 of them back to back to back. I walked the last couple hundred yards on the second two towards the top. The nice thing about them was each of the three peaks had a super down hill run. I got to going over 30 mph on each of the three peaks. Another good thing was that the three killer peaks were first thing this morning when we were fresh and then the afternoon was a nice comfortable ride to our destination. We rode for 62 miles today, 30 climbing the three killer peaks and coming down them and then 30 miles this afternoon riding on rollers that weren’t to high. The next two days we are going to stay here in Ingram, Texas in the “Campground down by the River”. I borrowed a fishing rod from the lady in the office and I am going to see if I can catch any fish tomorrow. The river is the Quadalupe River and it is supposed to be full of perch and bass. Sunday is Easter and there is a church within walking distance of where we are camped and we are looking forward to attending and being blessed by the Lord for choosing to go. This entry was posted in Uncategorized on March 26, 2016 by deefduke. Last night we were camped at an RV park in Brackettville, Texas. Patty and I sleep in a 4 person dome tent. About 10 pm lightening started with super loud thunder and periodic downpours of rain. You can see through the tent if the light is bright enough so it was no problem seeing the lightening flashing all over the sky and hearing the thunder as we laid there. When it rained it down poured and it sounded like we were inside a bass drum in the tent. It was kind of a fun experience for us. This morning it was totally clear and the ground was dry and there was no clue that it had rained. We have not had a single day of rain so far on this bicycle trip, and by the way I still have not had a single flat tire. This entry was posted in Uncategorized on March 25, 2016 by deefduke.